The average amount of paper purchased in 2011-2012 was 23 tons, i.e. 43% lower than in 2009-2010, which corresponds to a per capita consumption of 2.3. 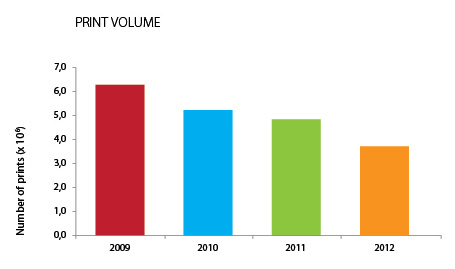 In 2012 (3.74 x 106 of printed pages) FEUP printed 1.1 million fewer copies than in 2011. Reduce the margins on the sheets, as well as the font size. Did you know that 40% of harvested wood is processed as paper? 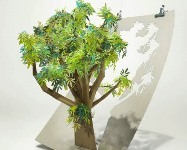 Did you know that the paper consumed at FEUP in 2011-2012 is equivalent to the felling of 552 trees? FEUP has settled new lighting equipment based on the use of LED’s technology, which although more expensive, is recognized as being more economic and efficient during the operating phase, and has a longer average lifespan. 2012 saw a slight decrease in electricity consumption (6,68 x 106 kWh) compared with the previous year (2,5%), with 787 kWh per member of the academic community being metered. Consumption of natural gas has declined over the past 5 years, consumption in 2012 being 103 x 103 m3, corresponding to 12 m3 per capita. Did you know that computers and TVs in standby mode use at least 10% of the electricity they consume when fully switched on? 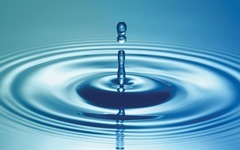 In 2012 water consumption decreased for the first time in the last five years (11% compared with the previous year), showing a value of about 42 518 m3, equivalent to 5.0 m3 per member of the FEUP community. This decrease is the result of small interventions, including faster detection and correction of faults in the toilets; it is also due to the fact that FEUP’s residual use level (nocturnal) was longer. Do not leave taps dripping. In case of a broken tap, report the problem to Technical Maintenance Services. Do not use more water than necessary, but be sure to flush the toilets. Did you know that a tap dripping at the rate of 45 drops per minute wastes 100 litres of water per month, equivalent to 30 baths per year? FEUP ensures the segregation of hazardous waste, directing them in a proper manner through non-municipal waste management operators authorized by the Ministry of Environment. 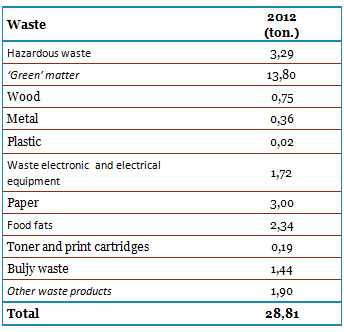 N.B: This does not include refuse collected by local council services (solid urban waste and recyclable material). 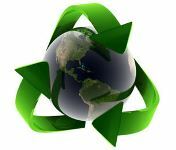 FEUP has several waste disposal tips. Please use them correctly! Dispose of waste in the appropriate location! Were you aware that by effectively separating waste materials, it is possible to recyle them? And that this means saving on energy and raw materials? 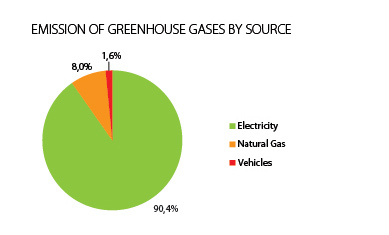 In 2012 greenhouse gas emissions stemming from the use of natural gas, electricity and vehicle circulation within FEUP amounted to 2,774 tons of CO2 (equivalent). 3Emission Factors: CO2: 3,16 kg/kg fuel; CO: 70,1 g/kg fuel; CH4: 0,80 g/kg fuel. Do you know that there are tools that allow us to estimate how much land area is needed to support our lifestyle? 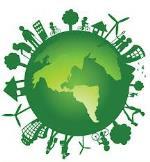 Estimate here your ecological footprint . FEUP has about 23,000 m2 of green spaces (27% of the total area of the institution), where you will find 24 olive trees from Alqueva which, due to the construction of the dam, were doomed to disappear. Their re-utilization constituted the commencement of the beautification and enhancement of the green spaces and landscaped environment of the FEUP campus. This reclamation of the natural vegetation, an essential aspect of FEUP’s environmental strategy, deserves to be highlighted as a further contribution to the sustainable development policy pursued by the Faculty. FEUP also seeks to assist public or private nonprofit-making institutions, through the donation of equipment that they lack and which are regarded as surplus to requirements. In 2012, 58 items of computer equipment were donated. FEUP collaborates in various projects of social solidarity, particularly in awareness- raising and fundraising, such as Amnesty International, the Solidarity Card, the Association of University Volunteers, the Protection and Caring Association, Gas Porto among others. The monitoring and supporting of students with Special Educational Needs. Culture also features in this institution with the organization by the FEUP Cultural Commission of music and dance spectacles, exhibitions, drama, workshops and art courses. In 2012, approximately 5,500 people attended events, of whom a significant proportion were external to FEUP. The higher education institutions play an increasingly active role in the development of the regions where they are located. The economic impact of FEUP activity is calculated by method of multipliers (Fernandes, R., 2007). The "multiplier" measures the impact of an initial e (or direct) cycle of expense in the local economy to which are added the impacts generated by successive cycles (indirect and induced) that result from this same expenditure (Robson et al., 1995). This impact can be expressed through a diverse set of measures. FEUP has chosen to use the local Gross Product - a similar measure to the Gross Domestic Product (GDP), but at local level. 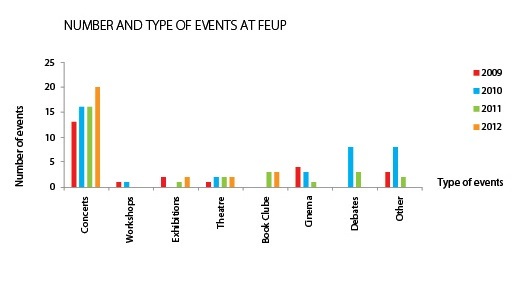 Concerning the economic impact itself, the results presented in the following Table show that the overall impact of FEUP was approximately 86 million ¤, being the municipalities closest to FEUP that have benefited more from the physical presence of FEUP, i.e. Porto (50%) and the remaining municipalities of Greater Porto (30%). Similarly, the multiplier effect on the local gross product (or the induced impact), which was estimated to be around 35.5 million ¤, has been particularly significant in Porto (65%) and in the surrounding municipalities (25%) (A. Fernandes, 2013).